I’m not really sure why it never dawned on me to make pizza in my cast iron skillet. 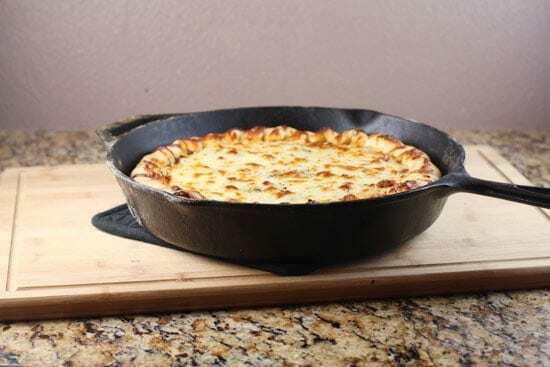 After all, Chicago pizzerias use cast iron to make deep dish pizza and it has qualities that are sure to make for good pie. Namely, it gets really hot and stays really hot. So, I was very happy when it destroyed all the other options in last week’s poll. I guess you guys want to know how to make pizza in a skillet! Well, I’m happy to oblige. There’s just one or two tricks that I discovered along the way. It’s pretty straightforward though and the pizza came out AWESOME. Cast iron pizza means you don’t have a pizza stone! Use your cast iron skillet to make really good homemade pizza! 1) To make dough, add water, sugar, salt, and yeast to a bowl and stir. Let sit for 5 minutes so yeast dissolves and starts to foam. Add flour and stir well to combine. 2) Use a hand dipped in water to vigorously work the dough until it forms a ball. Let the dough rest for a few minutes and then continue to work it until it is really soft and pliable, about 5-6 minutes of mixing. 3) Coat the dough with olive oil and store it in a plastic bag. Let it rise at room temp for an hour, then punch it down, reshape it into a ball, and store it in the fridge for at least 2 hours. Remove it an hour before you intend to make pizza. 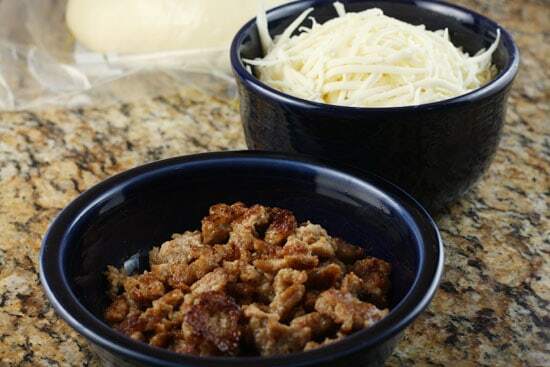 4) Prepare all your ingredients: brown sausage, chop basil and scallions, and grate cheese. 5) Stir together sauce ingredients and adjust to your tastes. 6) Roll dough out into a large circle and place it in the center of your cold skillet. Trim off excess dough, leaving about a inch of dough up the side of the skillet. 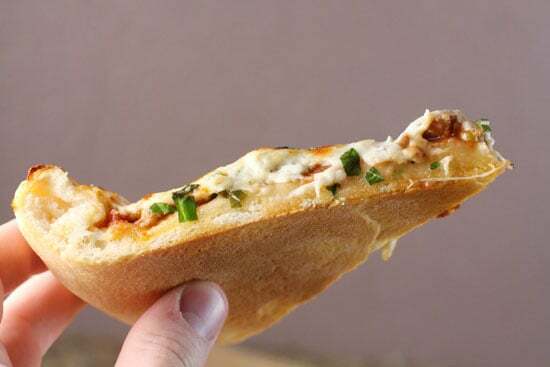 Use your fingers to fold the dough over itself, making a crust. 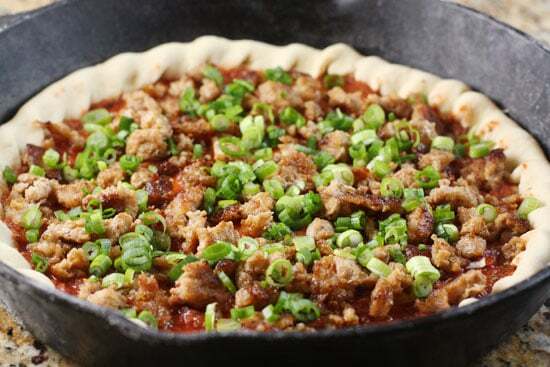 7) Add sauce, sausage, scallions, and cheese to pizza. 8) Cook the pizza ON THE STOVETOP over high heat for 3-4 minutes to rapidly heat the pan up. 9) Move the pizza to a 450 degree oven until the pizza finishes cooking, about 18 minutes. 10) Remove the pizza and use a spatula to carefully slide the pizza out of the skillet. 11) Let it cool, slice it up, and serve it! This is my standard recipe for a thicker pizza crust. You wouldn’t want a really thin crust for this pizza. It would just burn I think. For the dough, mix together water, sugar, salt, and yeast in a bowl. Stir it together and let it sit for a few minutes until yeast is dissolved and foaming a bit. Then add in your flour and stir it together. By hand is for winners. Use a hand dipped in water to vigorously work the dough into a ball. As you work the dough, you might notice that it’s too wet or too dry. For example, my photo above, top right, is too dry, I added a few extra tablespoons of water. The dough should be pretty moist and flexible. If it seems firm, let it rest and relax for five minutes, then continue to work it. After about 8 minutes of kneading it, you should have a very soft ball of dough (bottom left). 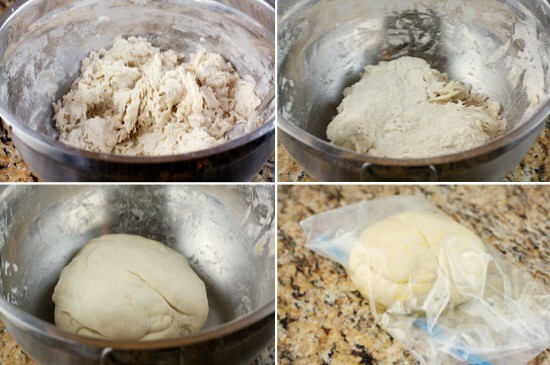 Coat the dough well in olive oil and place it in a plastic bag. If you’re using the dough the same day, let it rise for an hour at room temperature, then take it out and de-gas it. Reshape it and store it in the fridge for at least 2 hours. Then take it out of the fridge at least an hour before you need it. I kept my toppings for this pizza pretty straightforward, but you could use any toppings that you would put on a normal pizza. The sauce I used is just some dried spices stirred into tomato sauce. I kind of play with it every time I make pizza. It’s always good though. I also chopped up some scallions and basil, browned some sausage, and grated a lot of cheese. This was the part that I was kind of winging. While normally, I would heat up my pizza stone and just slide the pizza on it, I knew this wouldn’t work with the cast iron skillet. I didn’t want to be putting dough in a very hot skillet. So I started with a cold pan. 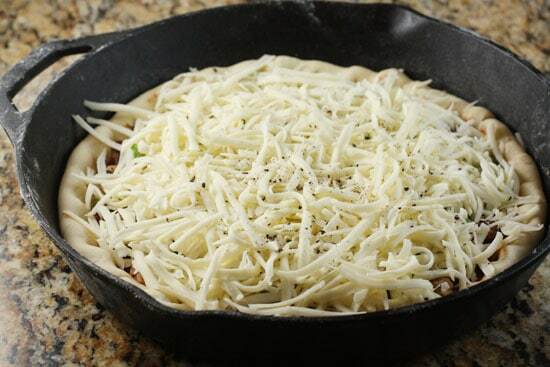 Roll the dough into a large circle and just plop it in the center of your skillet. You don’t need to oil the skillet or anything. The dough shouldn’t stick to it at all assuming you have a well-seasoned skillet. Once the dough is in your skillet (top right), use a knife to cut off any extra dough, leaving about an inch of dough up the side of the skillet (bottom left). Then use your fingers to kind of just fold the dough over itself, forming a crust (bottom right). Now we can make some pizza! 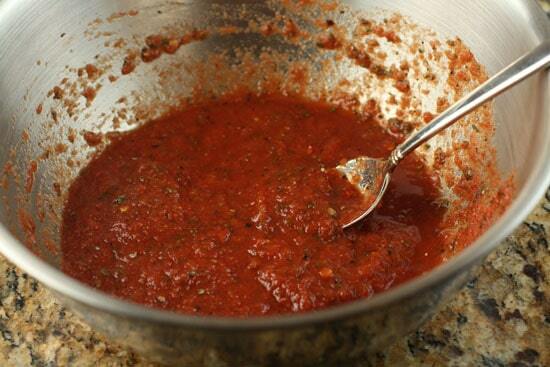 Add a light coating of sauce to the pizza. You probably won’t need all of your pizza sauce. Then add on the sausage and scallions. Next add on all that grated cheese! I also sprinkled on some freshly ground pepper just for extra flavor. So I had a problem at this point. I know that to get a good crust, the dough needs to be cooked at a really hot temperature. The hotter the better. But I have a cold pan which will take forever to heat up in the oven. So I thought I’d just cook my pizza on the stove top for a while which would heat up the bottom of the pan really quickly without cooking the toppings. Crank up your stove to HIGH heat and cook the pizza over high heat for about 3 minutes. You won’t notice any change in the pizza, but the pan should be really hot. Then move it to a 450 degree oven and continue to cook it until the crust is browned and the cheese melted. This took my pie about 18 minutes. When your pizza comes out of the oven, you should be able to get a spatula and just slide the pizza right out of the pan! Let this cool for a minute or two and then slice it up. The real test for me was the crust and I thought this was a really good crust. Nice and crispy but still somewhat chewy. As I see it, this pizza was as good or better than a lot of pizzas I’ve made on my pizza stone! It was awesome. The only downside to the cast iron method is that it’s kind of hard to make more than one pizza in a row. 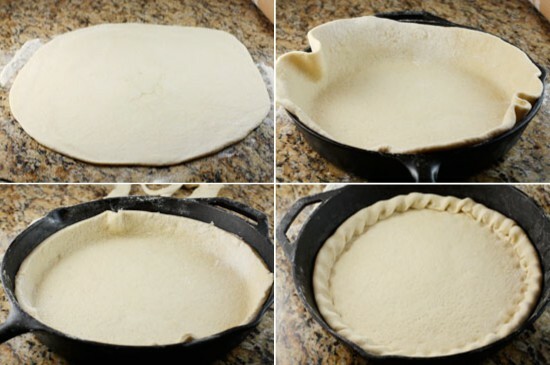 When you pull out your first pie, your pan will be way to hot to shape another pie in for at least 15 minutes. This probably isn’t a big deal unless you’re planning a pizza party or something. Chalk this up to another incredible use for a cast iron skillet! Looks delicious. How big is your skillet? I only have an 8" one, which may be a little small for this. I've been thinking about getting a larger one. Yea. that's a bit small for this unless you just want a personal pan pizza… I think mine is a 12 inch, but a 15 inch would work also. I cut the dough in half. Since I like a thinner crust I make mine in a 10 in pan. I make a thick crust pizza for my husband in a 8in pan. It works perfectly. Btw, this is my favorite pizza recipe! Um, making this immediately. Actually I am getting a cast iron skillet immediately, and then immediately after, I'm making this pizza. Thanks for giving me a reason to finally go buy one. I usually steer clear of deep dish pizza because I think it's a joke, but I'll give Nick credit for this one, it was amazing! It's a rare day when my loving wife comments on something! This must be done in my kitchen ASAP! Looks good! How do you think using cornmeal on the bottom would work? You could do it, but normally I add cornmeal just to make it easier to move the pizza around… not really necessary in this case. But if you just like the flavor/texture, you could throw some in the bottom of your pan before you add the dough! I love the crust to be crunchy. The Domino’s Pizza” by my place has this seasoning on their crust I just love. I can’t figure it out.Its zesty tasting?? Oops-meant "thin" crust, not "this" crust. I'll be making this ASAP! That's a beautiful pizza, Nick! I don't think you can beat cast iron for pizza crusts. I used a cast iron frying pan for making pizzas for many years, and recently broke down and purchased a cast iron pizza pan. It makes really nice thin crust pizzas. But I don't think I've ever made a pizza as pretty as yours! I have a great solution to this…. buy another 2 cast iron pans, or have a BYOP to the pizza party. LOL. I love the idea Nick! Now I know exactly what I am going to do with that leftover dough from the Deep Dish Pizza recipe! I am so making this as soon as I get back from Austin! My recent post Places I can’t wait to Eat at while in Austin! Just in time for Pie Day on Monday 3/14! I'll probably top mine with just potato, rosemary and olive oil. I can't believe I never thought of baking a pizza in cast iron before. Thanks, Macheesmo! Pie Day… by which I mean Pi Day. Wow, great cast iron skillet recipe, thanks! What’s the name of your blog? Would like to see the baguette recipe. I took a few bread making classes; some good and some so not. Bummer! A day too late. Made pizza last night, and while it was delicious, I should have done this. I've been making yeast breads for 40 years but I've never heard of "de-gassing" the dough. Do you mean to just let the gas out of the bag, or do you actually punch air bubbles out of the dough at that point? I tried this a few months ago and loved it. 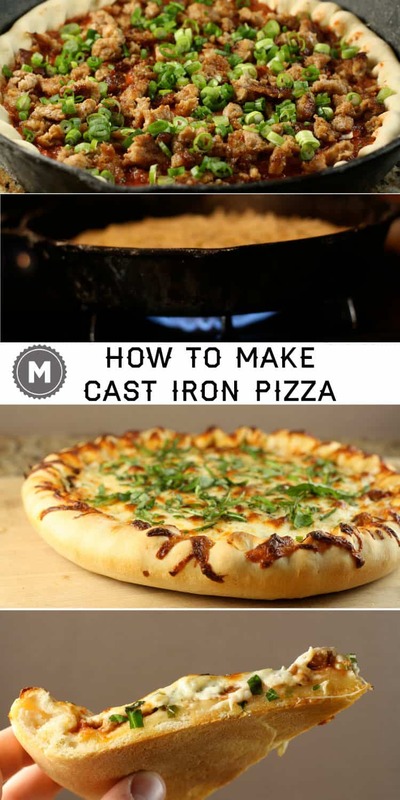 I am a total convert to cast iron for pizzas – it is much better than a pizza stone. I even bought the Lodge cast iron pizza pan so I could make them bigger! nick you are the man!! GENIUS! heating it up on the stove top first. I make pizze in a cast-iron skillet, too. I love doing that. I actually heat up the skillet in the oven before putting in the dough, but I get away with it because I don't do neat decorating like you did :). So, it is possible to do it that way. Your pizza looks amazing. I make my own sauce similar to how you do it, too, and my dough recipe is like yours (I now use honey instead of sugar). Argh! You're making me want to make a pizza tonight haha. GORGEOUS photos! Looks great, I think I'm going to have to try this out this weekend. 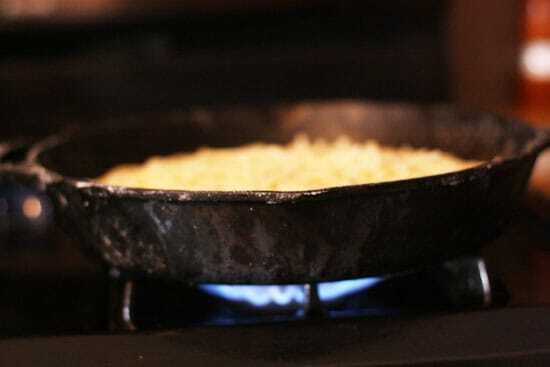 I love my cast iron skillet – it's the most used item in my kitchen. Have fun in Austin. Cancel my Friday night plans because I need to make this pizza. Wait, my Friday night plans already included pizza. But the pizza I had in mind is not nearly as cool as THIS pizza! YUM! I need to upgrade my pizza recipe!! I'm a big fan of your website and I just really have to say, as a newcomer to baking bread and pizza, this was an absolutely fantastic recipe. My boyfriend and I made a mashed potato pizza and a meat lover's pizza and both were phenomenal, thanks so much! This recipe is especially helpful since we don't own a pizza stone…yet. I have seen this done before but never tried it due to the hot pan, cold dough thing. Heating it up after the pizza was made was a great idea, but duh I burned the bottom. No worries though it was still really really good and I will be doing it again and again! I bought and seasoned a cast iron skillet just to try this out! Turned out quite well (though not as pretty as yours). Thanks for posting :D I've bookmarked around 15 things to try so far and linked this blog on my Facebook account. If I make the dough the night before, I assume nothing special has to be done except let it come to room temp? Nope! Just let it come to room temp and you're good to go! I just made this and it came out so nice! I used my own sauce recipe but followed your steps exactly other than that, and it was wonderful. The crust was just perfect and the flavor was excellent. Thanks! I just made this – lovely. I used a cup of whole wheat flour. Spinach instead of meat and scallions, and on top thin slices of chile perrón and tomato. Mozz, and parm. Yum! :) Thanks much. What kind of sausage did you use? It looks really good, and I'm really picky about certain things, this being one of them! Looks good! I was thinking about doing something similar with my pizza tonight. My plan was to put the skillet in the oven, build the pizza on a cardboard sheet (which is my pizza peel), and then shuffle it into the hot skillet. It'd be some sort of deep dish approximation. But I ended up going regular pizza stone… keep your eyes peeled for when I try this. I made this tonight and it came out GREAT! Thanks for the technique! My recent post Presenting…the Cakewich! i tried this recipe and I LOVE IT! Thanks for sharing! I tried this last Friday night. I'm attempting to confront my fear of yeast and had to run out to the store after 3 attempts to start yeast (with my old stuff from the back of the cupboard) for some brand-spanking-new stuff. I need to learn the difference between yeasts because they were all labeled slightly differently… I ended up with "highly active yeast" — they sounded like champions and proved themselves without fail. However, my dough didn't rise as much as I expected it to during proofing. Breads I've attempted doubled — this did not … I almost pitched the whole project, but decided to chill it, warm it and see where I netted out. We could get take out pizza in a pinch. I followed instructions and wrestled the dough into submission. I'm recovering from shoulder surgery so getting the dough to stretch to the size of my 12" cast iron skillet with enough up the sides for a rimmed and pretty crust like yours proved IMPOSSIBLE! I ended up with a freeform, 0-entry edge (like those swimming pools that drop into the horizon). Could this receipe net out dough big enough only for a 10" skillet, or should I expect to be able to get this to the edge and beyond in a 12"? While not the prettiest edges I've seen, the end result tasted like heaven. Traditional deep dish (I'm a native-Chicagoan) — a crunchy snap to bite into and then chew, chew, chew … with sausage, tomatoes and mushrooms. Don't get me started with the "Should I cook the mushrooms first or not?" debate I entered. I didn't want the white button mushrooms to lose their water all over my pizza (that sounds gross). I ended up honing my knife skills, slicing them as absolutely thinly as I could and leeching them over paper towels with a little salt then adding them for the last half of the cooking on top of the cheese — I got unsoggy mushrooms, slightly crispy on the edges exactly like I wanted! Nick, if you have time to answer, I'd appreciate it greatly, because this a keeper… good rehab for the shoulder and makes my husband dance in the dining room chair. I love this site, thank you so much for taking your time and keeping it interesting and inspiring. Thanks for reading and for trying out the recipe. Sorry to hear about your shoulder. I can see how that would definitely make things tricky. For starters, on your yeast. "Highly Active Yeast" should work just fine. I use "ActiveDry" yeast but I've used both without problems. Just make sure to give your yeast 5 minutes or so to dissolve completely in your water before adding the flour. Also, make sure that your water isn't too hot, it should be just a bit warmer than room temperature, or you'll kill the stuff. On the rise, pizza dough doesn't necessarily need to double in size. If it doesn't rise at all, then that's a problem. It sounds like yours was okay. The real key is to make sure you take it out of the fridge at least an hour (2 hours is even better) before shaping the pizza so the dough relaxes really well. On shaping, yea… it sounds like maybe the shoulder held ya back. This should be more than enough dough for a 15 INCH pan. It's a lot of dough. You should be able to stretch it pretty thin. It sounds like you're on the right track though. Pizza dough is one of those things that just takes a bit of practice. Maybe once your shoulder heals, give it another shot and hopefully you can get it to fit the pan better! This may be a really stupid question, but could you use an enameled cast iron skillet for this? A la le creuset? Or should I just go get a "real" cast iron skillet? (which I probably need anyway?) Thanks! Heya! Yea… I don't see why you couldn't use it. Should work just fine! Thanks for the reply! After snooping around and reading your "10 reasons you should have a cast iron skillet" I might go for the real deal also! New to your blog and its awesome! Nice job. I can't wait to try this recipe. I was given a cast iron skillet as a gift in Honduras. A rare item here! I have been experimenting with different recipes. This one, I can't wait to try it! Sounds fantastic! I just got a cast iron skillet from my grandmother, so I’ve been looking forward to getting it seasoned and making all kinds of delicious stuff. I’ll be making this right after chili and cornbread! We actually use two cast iron pans in the oven at once. I have one with high sides and another with low sides. The low sided cast iron skillet’s handle is low and fits nicer under the handle of the bigger one. I pour olive oil in the pan to grease it and I wipe the excess out with paper towel so it is nicely greased by doing this it makes the underneath of the pizza so golden and crispy and it does not stick at all! Cristine here again…. I wanted to further add that I do not heat up the cast iron. I just prepare the dough and put it in to a room temp. skillet. I recommend not heating the cast iron skillet, unless you want a crispy bottom crust. For my taste it was too well done. Great recipe though and an excuse to buy another skillet! Made this for dinner tonight. Really good. Hadn’t thought of using my cast iron for this before. To speed up making more then one, I just put shape and top the pizza before putting it on the hot pan. I thought to try my cast iron skillet out for pizza last year. I LOVED the taste and consistancy of the crust. It was so good. I bake mine at 500 in the oven. I tried this and this was hands-down a new family favorite! Thanks! I used pre-made pizza dough (cheater, I know!) and used different toppings (to accommodate my plant-based diet)… but I made a cast iron pizza last night and it was amazing! Thanks, Nick, for sharing this recipe :) It is sure to be a staple in my home. I made this pizza-in-a-cast-iron tonight and oh my… possibly the best pizza my boyfriend and I have ever had. It was SO thick. My kind of pizza! We LOVED this and will definately definately be making it again, thank you! I love this because I can make 2-3 different types of pizzas in smaller skillets (#8 & 7). My crust comes out perfect without cooking it on the stove. I just learned how they make cast iron (and I’m a huge fan of my cast iron skillet as it is) I had to share this with you – http://honeywithoutflowers.blogspot.com/2012/11/cast-iron-patterns-soule.html – but seriously. This pizza recipe is genius. I can’t wait to try it! Thanks for sharing your love for cast iron!! I’m just wondering what size skillet you used for this amount of dough. Hey McD, I used a 12 inch skillet for this version. I think you could do a 15 inch skillet also honestly. I had some extra dough when I did mine, but that also depends on how thick you want your crust. Obviously you’d have to roll it a bit thinner to get to 15 inches. Good luck! Finally did it! 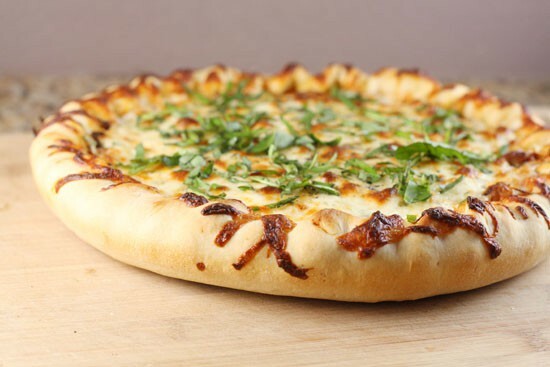 We all decided this is about the best at-home-thicker-crust we have ever tasted. Thanks man! I ended up using an 8 and a 6 inch skillet. There was just a right amount of dough. This is a huge hit in my house. I get feedback saying this is the best pizza they have ever had. Tried this. Cooked it only 13 minutes in oven at 450. Crust was completely burnt. Ate it without the bottom burnt crust. Very good. Have you tried doing a Chicago style stuffed pizza this way? Oh also, if you do deep dish, don’t do the pre-heat over the stove thing because it will need to bake longer in the oven and might burn. Just made this last night and we LOVED it! It will definitely be a regular in our monthly meal planning. i have been making pizzas in a large cast iron pan for over 20 years on my bbq. Just purchased a cast iron skillet JUST for this reason- can’t wait to try it out. The pizza stone is great but this just looks a lot more fun! Just a thought- why couldn’t you preheat a stone in the oven and just put the cast iron on top of the stone to skip the stove-top step completely? It seems that the cast iron should get to temp quickly from conducting heat from the stone. Followed your suggestion about the pizza stone. It worked like a charm. We used a 15 inch cast iron pan and baked for 18 minutes. Great. Thanks. Great recipe! For those who want to do multiple pizzas at once, I had doubled the recipe and cooked my second pizza in my 12″ all clad pot. It was a little hard getting out of the pot due to the 6″ sides, so next time I’m going to use my saute pan with the 4″ sides instead. There was a slight difference between the two and I think the all clad didn’t rise quite as much, but I also didn’t heat that up as much on the stove as I did the cast iron pan. I think I just need to tweak the cooking time/stove top time. Hey Jeff – So you used an all clad pot. Was it made of stainless steel or something else? I am curious about sticking or if it just formed a nice crust and came out… Thanks! A very late reply… but it was a stainless steel pot. It didn’t stick with the amount of oil, but be sure to coat the sides. I liked the cast iron crust a bit more, but my wife like the pot version. I’m making the pizza right now. I will be making two pizzas, mine will be a little thinner on the crust, will take pictures and publish if I can. I prefer cast iron pizza to using a stone. I have skillets but I also have the Lodge cast iron pizza pan. I found putting my dough in a cold pan then into the oven did not cook the pizza well so rather than use a peel to slide it onto a heated pizza pan, I use parchment paper to put the dough on. While the cast iron is heating up, I prepare the dough on the parchment paper and just slide everything onto the hot pan. I just made one tonight, the best pie with bruschetta mix on top and cheese. I really like how you’ve prepared the crust – very nice presentation. Now, the “Heat Trick” – that’s just great thinking! I will have to try that next time. Thanks for the recipe. I frequently mix bread and pizza dough in my Kitchenaid mixer fitted with the dough hook. Do you think I will get the same results using your recipe in my mixer as long as I do the refrigerator and room temperature rises? Finally made it! My daughter told me it’s the best pizza she’s ever eaten:-) Thanks for sharing! I have made this pizza several times and the pizza’s came out great! I did need to make more than one that same night so what I did was cooked just my pizza dough for about 5-7 mins, took the pizza shell out and repeated the process. Of course I had to let my pan cool down some, but they both turned out great! That’s a great idea Jeannie! Thanks for the tip! Made pizza in cast iron when I was in Home Ec in high school. We learned to make homemade dough, but to save time we used crescent rolls and put string cheese around the edges and made stuff crust pizza. What an amazingly easy and delicious pizza. This recipe will be my go-to pizza recipe now. Thank you so much! Just finished my steak and blue cheese balsamic oil. cast iron pizza. What a winner that was, just watch your crust, but a little char is good, I cooked up thin slices of steak rare and then put them on my pie. Everything melded together, oh yeah I had premade pizza dough from the grocery so I had a restaurant quality meal in about 20 minutes. Unbelievably good!!!! I have never left a review of a recipe before but this… THIS was amazing! I recently reconditioned an old griswold skillet and have been on a mission to make as much in the skillet as I can. I used your crust but used a leftover roasted eggplant sauce for the filling, topped with mozzarella of course. The crust was PERFECT – crispy on the bottom and chewy on the inside. I can say without a doubt this was the best pizza I’ve ever made, skillet or no. PS if you’ve never tried it before, add a pinch of fennel seeds to your pizza sauce – it’s one of my favorite additions! What a wonderful way to make a two person pizza. It was one of the best pizzas I ever made. The crust was crisp and chewy and the toppings were perfectly done. This post has my favorite comment of yours ever — “by hand is for winners.” As someone who hand-kneads challah every week, I couldn’t agree more. Bread machines…why? Can AP flour be used or does it have to be bread flour? What is the difference? Looks delish! We are making it this Friday!!! Hey Cissy, you can absolutely use AP flour instead of bread flour. Bread flour has a higher gluten content so you end up with a more traditional pizza crust. It can stretch really well and gets crispy on the edges but is still nice and chewy in the center. I’ve made the dough recipe a few times with AP flour when I didn’t have bread flour and it’s still very good and works fine. Good luck! Just made this! Wow and yum! Wish I could post a picture. The crust reminds me of Italian bread! Definitely a winner!!! Thank you! Your cast iron pizza photographs are beautiful! I can’t wait to try this recipe soon. I’ve made a few in cast iron pans, BUT started it on stove top is a splendid idea, I may of just found the secret Thank You! huge and all kinds of funk can hide in there. you need all of the preservatives in the rest of the processed foods. Can instant yeast be used in place of the active dry yeast in your crust recipe? Yep. It should be fine to substitute Lynda. Good luck! This.looks amazing! I want to try this but my oven has broken down, any ideas on making this on a stove only and skipping the oven? That probably wouldn’t work… it would burn on the bottom by the time it cooked through, but you could do it on a grill if you have one (over low-medium indirect heat). Good luck! Hi Nick…I stumbled upon your blog and I have been on a quest for the perfect pizza crust for as long as I’ve been old enough to have my own oven that wasn’t an Easy Bake. And that’s quite some time now. I made your cast-iron pizza yesterday and both me and my husband were in crust heaven. And that’s saying something. Thanks so much! I had my last piece cold, straight out of the fridge for breakfast this morning. YUM!!! Hey Andi! Thanks for reporting back! I really love this crust a lot also. It’s about as good as you can do at home without a pro pizza oven. Glad you liked it! I’m paleo now but still love pizza. I am going to be using my beloved cast iron pan for a cauliflower crust pizza. I’ll let you know how it comes out. I use a cold cast iron skillet for pizza, as well. It works great on the grill. I typically brown burger, sausage or bacon in the skillet in prep for the pizza to give it a nice coating. I don’t worry about a pretty crust around the edges as I prefer to let the cheese touch the sides and crisp up. If your grill is too hot to cook the top before the crust looks done, throw it under the broiler for a few mins. The skillet is much more versatile than a pizza stone in this regard. Love the website. Keep it up! I’ve tried very similar recipes but the inside of the dough is always raw and the crust is a little overdone. Does yours come out raw inside? I can’t figure out how to fix it, I’ve tried lowering the temp an increase the time but that didn’t work and the cheese went funny. Any advice? Ah yes, but there are always those of us who truly crave a thick, AKA deep-dish crust. How DO we pull that off?? The basic critical components of the receipt are perfect! I added bell peppers, mushrooms, onions, jalapenos to the mixture, and it was the best homemade pizza I have ever cooked! Thanks for the critical paths of the receipt! « Stuffed Olives Three Ways Recipes Home » The Internet Kitchen: Austin Bound!